While all finalists will be featured in the July/August issue of Coastal Living Magazine, the winner takes home extra real estate in the issue, not to mention some hefty bragging rights. Between now and February 6, the public decides who the number one town is by voting online. It’s a vote that individuals can repeat every 60 seconds throughout the two-week period. And though the finalists’ rankings will be visible for most of that period, on Saturday, February 3 the progress will be hidden for the final three days of voting. Results of the competition will be publicly announced on June 12 at www.coastalliving.com. But still, the big question remains. What exactly makes a town “happy,” and to that extent, happier than another? After all, the ten finalists were narrowed down from over 300 nominations via social media. According to Coastal Living Magazine, commute times, crime ratings, walkability, standard of living, air quality and health of beaches are all quantitative qualifications, while the qualitative measurables come out during the voting period. Traverse City Tourism invites all visitors and locals to do just that this Wednesday, January 24 at a voting party at The Little Fleet in downtown Traverse City. Party goers are encouraged to bring their mobile device, their Traverse City pride and a thirst for victory. The Little Fleet staff will be slinging drinks in honor of the competition with special eats offered by the Milkweed food stall from 5-7pm. 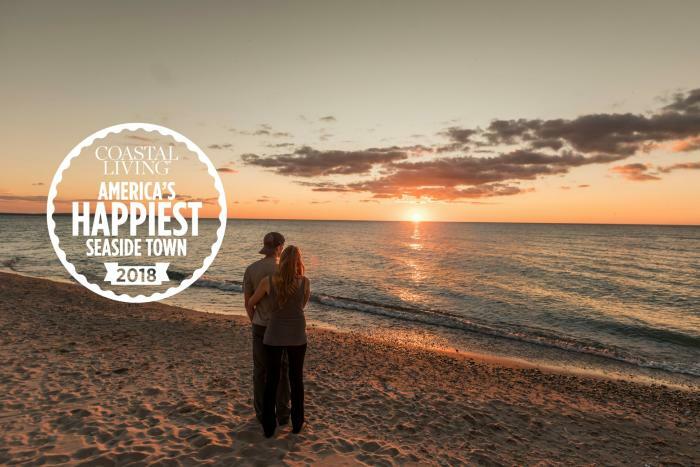 Come get happy in the Happiest Seaside Town in America (that’s #1 in Traverse City Tourism’s totally humble unbiased opinion).